Come and join us at the Hornbeam for a positivity-themed view of life for the exciting Preview night of the E17 Art Trail: 3-18 June 2017. Plus enjoy gorgeous organic snacks, drinks and music in our friendly cafe space. 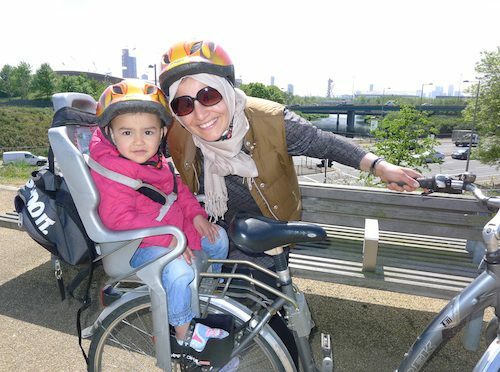 See our ‘Cycling for Fun and Sanity’ photo exhibition of pictures and stories from Hornbeam’s JoyRiders women’s cycling group in E17 (pictured) and JoyRiders family cycling group E4. Plus pics of cyclists from around Waltham Forest by members of Waltham Forest Cycling Campaign, photographers Jose Pedroso, Simon Warren, Jenna Selby, Alex Bell and Paul Gasson and a range of wonderful candid shots by everyday cyclists in the borough. Also love-themed prints and stickers from the LOVE Art Project by Cottontails, and a chance to give your vision of a beautiful, carbon-free future in E17 by adding to the Divest Tree made by Waltham Forest Friends of the Earth. View the art, find out about the many amazing community, low-cost living and sustainability projects run at and by the Hornbeam throughout the borough, and Love Life at the Hornbeam! Preview is Thurs 1 June from 7pm and then viewable in cafe opening hours throughout the E17 Art Trail.